It’s magic, really. Turn a knob and instantly a steady ring of blue flame leaps up. 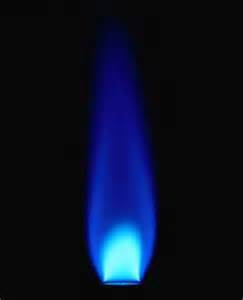 Blue is the color of health in a gas flame. It shows that the combustion is extremely efficient. Natural gas is a great cooking fuel. It’s easy to regulate because you can see it. When you change the flame height, the change in temperature immediately translates to the pan. With electricity, the pan blocks your sight and deprives you of a visual cue. Also, the heat from an electric burner lags. It can get much hotter than you intended, and can stay hot even after you turn it down. I’d miss my gas range if I couldn’t use it. ExxonMobil has a point: it would be much harder to cook an egg. In the quest to reduce greenhouse gases to say, 80% of 2005’s emission by 2050, are we faced with giving up our gas ranges? In these early stages of trying to bend the carbon accumulation curve downward, cooking isn’t a big target. There are much bigger ones. Electric generation, for one, contributes 32% of GHG emissions; transportation, 28%. Cooking is a fraction of the 10% of the emissions contribution from commercial and residential sources. In many parts of the country, an electric range probably emits more GHGs than a gas one for two reasons. First, the fuel for the electricity in many places includes a high percentage of coal, which emits about twice the GHGs as natural gas when burned. Second, if the power is coming from any distance, some of the power will be lost along the way. It’s more efficient to capture the heat directly from the burner than it is to capture it in a boiler or turbine, generate the electricity, push it through miles of power lines, then turn it back into heat by running it through a resistor—which is what an electric heating element is. A resistor works by making the passage of the electrons inefficient. That’s how the heat is created. So why does ExxonMobil focus on cooking an egg? Because it’s psychologically effective. It literally hits home. It’s a sly way of scaring us into climate change inaction. ExxonMobil is doing what corporations do: fighting to maintain its power and status through indirection, psychological manipulation, and subtle deceit. They learned their lesson on the knee of the tobacco companies. We can make great gains in GHG reductions by replacing EG and transportation fuels like natural gas, oil, and gasoline with much cleaner alternatives (like wind, solar, geothermal, and hydro coupled with efficient batteries), focusing on conservation and efficiency (like adding insulation and multi-pane windows to every building possible), technological innovation (like LED lighting), and land use reform (like reviving train transit). But that means leaving Exxon’s major assets in the ground. It’s going to take some thinking to get around that.